Electricians are one of the most vital components of the world today. Across Pennsylvania, electricity is crucial to keeping society running from lighting homes to keeping offices and stores functioning. Without electricity, the nation would be crippled. Electricity fills important roles in our lives in ways that no one gives a thought to any longer. What would you do if one day you had to wake up without an alarm clock? What would you do if once you woke up and shuffled downstairs, you were unable to turn on the automatic coffee maker? You would be without light, refrigeration, air conditioning, heating, hot water, and so much more. Would you be able to function and be productive? Electricity and electricians are vital to our way of life so start your education today by locating an electricain program in Pennsylvania..
With electricity and electrical systems providing so many essential functions in day to day life, there is naturally a great need for electriciansin Pennsylvania. Electricians complete many tasks as part of the job from installations, maintenance, and repairs of electrical wiring, fixtures, and equipment inside of homes and other buildings. On top of that, they also inspect anything electrical to be sure that is in accordance with any relevant codes and functioning properly and efficiently. Nonfunctional or malfunctioning electrical wiring or systems can be extremely dangerous. Electricians are necessary to help keep the private and public systems safe. One of the most prevalent causes of fires in Pennsylvania are due to faulty wiring or other electrical components. As we covered so far, electricians fill an important role in society. But how do you become a licensed electrician in Pennsylvania? There is an important series of qualifications you must meet first. After which, there are series of educational steps you need to take in order to become licensed. Some educational prerequisites to becoming a licensed electrician are optional and others are required. In order to meet the prerequisites in becoming an electrician you must be at least eighteen years old and have a high school diploma, GED, or another equivalent. Higher education is often sought by would-be electricians after they have finished high school. There are many different options for schooling when seeking to become an electrician. The most common is technical school. Oftentimes technical schools offer programs or courses in circuitry, safety practices, and the basic electrical information which makes up the base of the work completed by electricians. The completion of technical school typically results in an associate's degree in electrical technology or electrical construction. If you wish to become an electrician but want to first complete a higher level of education past an associate's degree, there are options for you. At many standard four year colleges there are bachelor’s degree programs in fields such as electrical engineering. If you would rather not go through such a long time commitment, there are many certificate programs out there, but, you must be wary of these. If you do choose to go this route, be sure to check that the program is through an accredited organization and not just a waste of your hard earned money. While there are several different routes to explore when pursuing higher education in Pennsylvania to become an electrician, but none of them are strictly required. An apprenticeship under a practicing electrician is necessary however. Despite the fact that higher education is not strictly required, this does not mean that gaining higher education beforehand is lost cause. Oftentimes, students who have completed one of these higher education programs receive credit toward their apprenticeship from time spent in pursuing their certificate or degree. In order to qualify for an apprenticeship, students must be eighteen years old, have a high school diploma or GED, achieve a qualifying score on an aptitude test, pass a drug test, and have successfully completed one year of algebra. During a standard four to five year apprenticeship, apprentices must complete 144 hours of technical training and 2000 hours of paid on the job training each year. This must be completed through their employer and the all of the training must be done under a licensed electrician. During technical training, apprentices study vital subjects such as electrical theory, blueprint reading, math, electrical code requirements, safety and first aid, and more. Which Educational Program is Right for you? With all of the options out there, it can be difficult to decide which educational program is right for you. Should you search for certificate programs, a two year college, or a four year college? What about a trade or vocational school? It can be difficult to determine which of these is the best option for you and your personal situation. In order to figure it all out, go through the necessary requirements in order to take on an apprenticeship and decide how well you currently fit them. Have you successfully completed a year of algebra prior to graduating high school? If not, completing at least a two year program may be one of the best options for you since you will need at least a year of algebra specific math. If you have not yet graduated high school or need to complete your GED then that is definitely where you want to start. Be sure to get in that year of algebra before graduation. Another great indicator of which type of program is the best for you is your score on the aptitude test. The aptitude test is typically taken prior to entering your apprenticeship but if you don’t know where to start, go ahead and take it. If you score well, perhaps a certificate program would be okay. If you do not do as well, then an associate’s degree may be the better option. If you still aren’t sure, try consulting some of the other articles on college-univerities.com. Another option would be to contact a career counselor at a local college or high school. Whether you choose to go to a complete a certificate program, attend technical school, go to a four year college, or attempt to jump right into the field with an apprenticeship, you will often have to complete continuing education throughout your career. Continuing education is not unique to electric work. Many occupations have a requirement for continuing education of some sort throughout individuals’ career paths. For electricians, continuing education is typically done through courses or certifications which update practitioners on new practices in the field, provide reminders on proper safety and first aid, and inform students on any important changes to the national or local electrical code. In Pennsylvania, in order to be a licensed practicing electrician, you need to obtain a license by taking a certification exam within the Township or county you would are working in. Other than that, all you need to complete is the apprenticeship and the other basic qualifications (such as a high school diploma or GED and qualifying score on an aptitude test) listed before. Once you complete the apprenticeship through your employer, then the Pennsylvania Council will issue you a certificate stating that you are a recognized electrician at the journeyman level. 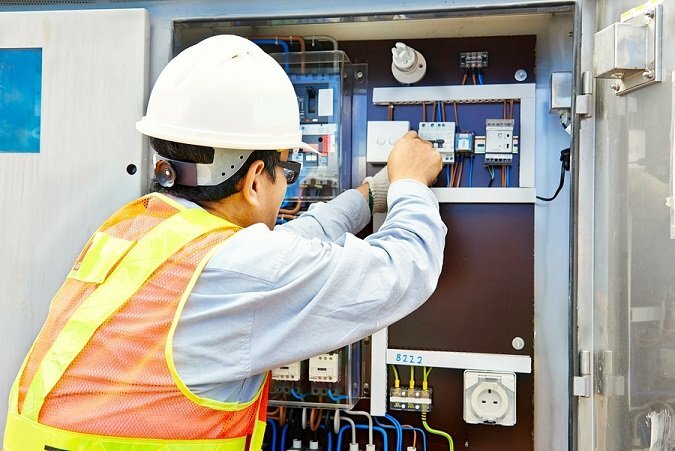 The job of electrician has become an increasingly lucrative position and will continue to do so in the next ten years. The current number of electrician jobs within the United States comes in at 628,800 in the year 2014. From 2014 to 2024 the projected growth of need for licensed electricians is fourteen percent creating 85.900 more jobs. Pennsylvania is currently in the top five states for the number of electrician jobs available and their average salary level. Nation wide electricians average $24.94 an hour, while in Pennsylvania electricians average $27.91. Yearly, electricians nationwide earn $51,880 a year with electricians in Pennsylvania usually earn around $58,060 a year. That is not the salary cap though, many master electricians earn up to $80,000 a year. Like many professions, the longer you are employed as an electrician and the more education and experience you have gained will lead to higher salaries and hourly wages. The field of electrical engineering will always be growing. Electricians will always be needed to fill crucial, irreplaceable jobs in society. Are you just graduating high school in Pennsylvania and looking for a new career or are you sick of your current job and want a complete change? Either way if you live in Pennsylvania and wanting to get started on your electrician training then you came to the right place. So what makes an electrician school a good school? Several factors go into making a good electrical school and the first is accreditation. When schools start out they must go through a rigorous evaluation from an accrediting agency. These agencies are overseen by the Department of Education. Once accredited the school can offer financial aid to students and the accreditation protects students in the event the school goes under. When researching schools in PA I wouldn’t enroll in any school unless they can show you their accreditation and prove it is valid and they aren’t on any suspension. The second thing to look for is the quality of the campus. This is important as you’ll be spending all of your time doing wiring and hands-on training for your electrician certificate. Before enrolling take a quick campus tour and let them show you their electrical lab and equipment. The third thing I’d research is the success of their graduates. Go online and search the school to see if anything negative comes up. Because becoming an electrician is a pretty straight forward career choice you won’t typically find people claiming they didn’t have a good experience (unless they couldn’t pass the final exam). More than often we see comments where students complain about a particular instructor. You can also interview the instructors at the school to make sure you are a good fit for the school. The last thing to review is tuition costs. Most electrician courses we found in Pennsylvania run between $8-15K but we have seen a few higher depending on the time it takes you to complete the training. With over 70 years of experience NCST has the necessary experience to get you trained a trade program. They are a military friendly school and use the same equipment to train you as an electrician as you’ll use in the field once you graduate. The school also offers job placement assistance once you complete your electrical course. 4164 US-422 Pulaski, PA 16143. Take the maintenance electricity and construction technology program from Triangle Tech. You’ll learn all about motor controls, electrical service installation, AC/DC motors, low voltage wiring and much more. Graduates will earn an Associate Degree in Specialized Technology (AST degree). They have campus locations in Pittsburgh, Erie, Greensburg, Falls Creek, Sunbury and Bethlehem.